Le Fournil’s classic yet sophisticated catering options are sure to enhance any meeting or event. We cater to Seattle, Bellevue and to the surrounding Puget Sound Area. Le Fournil offers free delivery for breakfast catering and lunch catering orders to the Seattle area seven days a week! Breakfast selections include fresh squeezed orange juice, Café Umbria coffee and seasonal fruit salad, as well as croissant and quiche platters. Looking for boxed lunches? We have you covered. 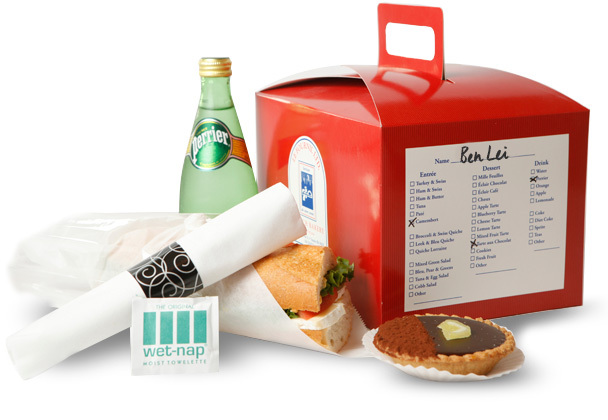 Choose our Brown Boxed lunch option for casual meetings and events or instead accentuate the details with our sophisticated Red Boxed lunch option. Alternatively, lunch can be created with sandwich platters, large salads, and an array of delicious French desserts. Vegetarian, vegan, and gluten-free options are available! Please share your feedback on our Google Business Page. Follow Us on Facebook, Instagram and Yelp!